New England is known for fickle weather. But when summer showers come, there's no need to sit inside and watch TV. 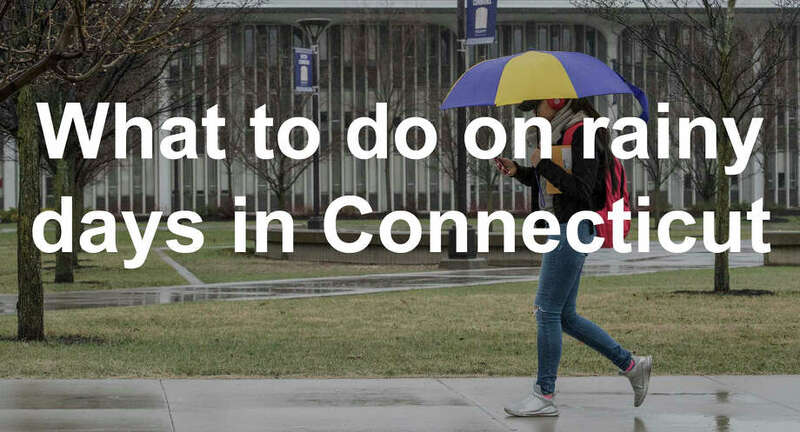 Here are 20+ ways to get out and enjoy summer in Connecticut even when the sun's not out. If you're going to be stuck inside all day, you might as well treat yourself to a good meal - or maybe even the best meal. Thomas Henkelmann in Greenwich has received numerous accolades including one of Open Table's 100 Best in the country and Business Insider's list of best restaurants in America. If fancy French food isn't your thing, here's the ultimate SW Conn. foodie tour. Mystic Aquarium is home to New England's only beluga whales. Connecticut's only zoo is in Bridgeport. Connecticut is home to hundreds of museums. Whether you're interested in art, science, history, puppets or even two-headed animals, there's a museum for you. Check out a list of 100 interesting and unique museums here in Connecticut. There are plenty of superstars coming to Connecticut. Check out where and when you can see your favorites on stage this summer, and for the rest of the year. Click here for your Connecticut concert guide. Your first thought on a rainy day might be "let's go to the movies." Before you check out the new releases, see what's playing at some of Fairfield County's more unique movie theaters. The Avon Theater in Stamford plays classics, documentaries and foreign films. Bethel Cinema shows some indie films. Edmond Town Hall in Newtown shows movies for $3.00. Click here for a full list of unique movie theaters in Fairfield County. The Maritime Aquarium in Norwalk is home to Southwestern Connecticut's only IMAX movie theater. Check out what movies are playing on the very big screen. Soak up some culture at one of Connecticut's theaters for the performing arts. You can catch a play, musical, concert, dance performance and much more. Take a look at a list of theaters in Connecticut. There are many examples of Victorian-era architecture right here in Connecticut, including Lockwood-Matthews Mansion in Norwalk, Yale Center for British Art and others. Take a look at more information on taking a Victorian tour of the state. Many famous authors once called Connecticut their home - Mark Twain and Harriet Beecher Stowe are just a couple. Check out some famous literary houses to tour. You can also read books right where they take place. Here's a list of some summer reading picks and where in Connecticut they take place. New England is known for charming architecture, and Connecticut is no exception. Take a staycation at one of Connecticut's classic inns and bed & breakfasts. Essex offers an escape on the river. Litchfield County is great for a country weekend. Click here for a full list of inns and bed & breakfasts in Connecticut. Relax by the sea at one of Connecticut's shoreline spas. If you want to stay closer to home, there are plenty of places to get a massage in Southwestern Connecticut. Check them out here. On Track Karting in Brookfield and Wallingford offers indoor go karting for kids and adults. If you've never done it before, you can even get a one-on-one lesson. Find out more. Kids should be active on their summer vacations, but that can be hard when it's raining. Luckily, Chelsea Piers in Stamford offers an array of indoor activities for kids (and adults). Check out what Chelsea Piers offers. If your kids like jumping around, you can also try an indoor inflatable play center. If you're into antiquing, you're in the right place. Connecticut is home to tons of antique shops, fairs flea markets and more. Click here for everything you need to know about antiquing in Connecticut. Clinton Crossing Premium Outlets, Clinton: Stores include Banana Republic, Juicy Couture, Polo Ralph Lauren, Kate Spade New York and Talbots. Tanger Outlets, Westbrook: Stores include J. Crew, Nine West, Williams-Sonoma, Eddie Bauer and even a 12-screen movie theater. Olde Mistick Village, Mystic: Stops for kitchenware, children’s clothes, glass and jewelry, and gourmet foods. Connecticut's two casinos offer more than just gambling. You can catch a show, have dinner, go dancing, shop, relax at a spa and more. Take advantage of a rainy afternoon and go brewery hopping along the Connecticut beer trail. Check out the local beers you can try. More of a wine person? Check out Connecticut's wineries and vineyards. Take advantage of a rainy day and learn to cook an impressive meal that you can serve at your next summer party. Here's a guide to cooking classes in Connecticut.